The 21st annual Quad State Honor Band Festival was held in Aalfs Auditorium on Sunday and Monday. 132 high school students from South Dakota, Iowa, Nebraska and Minnesota were selected to be a part of the two-day festival. John LoCognata, USD director of bands, said high school students can submit applications and be selected to be a part of two honor bands during the festival. 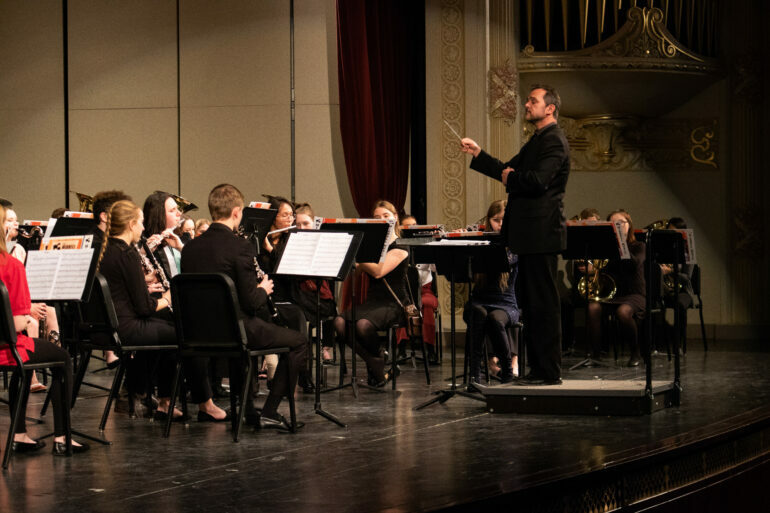 The top band is the symphonic band, which LoCognata conducted, and the second band is a concert band, which Dr. Todd Cranson, USD director of athletic bands, conducted. Two things LoCognata said are different for this year’s Quad State Honor Band Festival is that the students got the chance to have a masterclass with USD’s applied music faculty and they brought in a guest composer. Hannah Cooper, a junior clarinet player from Dakota Valley High School, said she enjoyed working with the guest composer. Todd Cook, Norfolk High School band director, said he’s brought students to Quad State Honor Band Festival for the past four years. This year he brought 12 students and he said it’s a great chance for them to work with two USD directors, the guest composer and other students. “It’s a great experience for them to get to play with students from South Dakota and Iowa and Minnesota,” Cook said. LoCognata said the festival is also a great recruiting tool for the university. LoCognata said his favorite part about the festival is just having the high school students on campus.